FDA’s traditional compliance requirements establish a uniform quality system framework, but do not ensure device quality across the ecosystem. Furthermore, a compliance audit will tell a manufacturer whether the system they have established is compliant with current regulations but offers no insight into how they might improve the device, the system, or the development process. 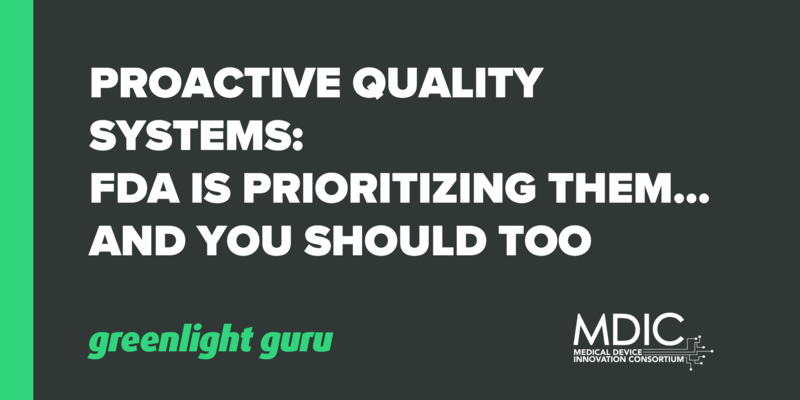 Taking predictive and proactive measures to improve quality can have far-reaching effects – from more efficient resource allocation to decreased probability of a recall. Conversely, manufacturers that fail to implement quality objectives as value drivers could put the future of their companies at risk. A 2017 McKinsey analysis revealed that the direct cost of quality is $26 billion to $36 billion dollars annually, representing 6.8 to 9.4 percent of device industry sales. FDA’s regulatory approach to ensuring compliance among medical device manufacturers has historically consisted of a series of assessment and enforcement actions. In its 2011 report, Understanding Barriers to Medical Device Quality, FDA found that this traditional compliance regime did not encourage agency investigators to “go beyond regulations to actively seek out quality issues.” Furthermore, it found that this approach concentrated manufacturer resources on compliance-related activities, and de-incentivized quality investment. As a result, in 2011, the FDA’s Center for Devices and Radiological Health (CDRH) launched the Case for Quality to shift medical device manufacturing from a culture of compliance to one of quality, and of competitiveness based on quality. CDRH prioritized engaging with industry stakeholders in this process, including groups like the Medical Device Innovation Consortium (MDIC) and AdvaMed, to understand industry needs and what it would take to incentivize quality. A recent report from CDRH leadership states that agency “achieved its goals and met or exceeded” all individual targets for the 2016-2017 Strategic Priorities. The agency’s 2018-2020 Strategic Priorities take additional steps to improve device quality through culture shifts and process simplifications, which manufacturers may also find cost- effective. In late 2017, CDRH announced its Voluntary Medical Device Manufacturing and Quality Pilot Program in concert with MDIC and CMMI Institute. This pilot program leverages a proven maturity model — the CMMI framework — by which medical device manufacturers can measure their ability to produce high-quality devices and increase patient safety. Participating manufacturers can use this measurement approach to drive targeted and continuous quality improvement activities within their organizations. Participation requires an investment of personnel and financial resources up front, as well as an annual program fee if accepted to the program, but CDRH believes that participating manufacturers should expect to improve processes and reduce variability, potentially leading to decreased costs of quality and rework. With the success of the pilot in 2018, CDRH intends to expand the program in 2019 and will roll out a new name for the initiative: the Case for Quality Voluntary Improvement Program. For more information on the program, visit http://mdic.org/cfq/enroll/. Free Resource: Want to learn about FDA's exclusive findings, metrics and future program plans from the 2018 Case for Quality Pilot? Download the PDF here. Investing in quality means continuous improvement in identifying, prioritizing, and mitigating risk early in the total product life cycle (TPLC), instead of reacting to quality issues as they occur. It entails taking time to think about all possible risks, maximizing understanding of the users and the use environment, understanding the significance of all risks and establishing appropriate mitigations, and proactively improving operations and systems that deliver better product quality. Unexpected problems in the field lead to extra regulatory oversight and special inspections. Manufacturers that have effectively invested in quality, thus reducing quality issues in the field, may face fewer corrective and preventive action (CAPA) issues. Additionally, investment can focus on driving organizational improvement, rather than managing the regulator expectations or requirements. This translates into less regulatory overhead and a reduction of activity that does not add value to the product, customer, or business. A focus on product quality and organizational excellence is one of the biggest levers a CEO can use to drive immediate value to the bottom line. Designing for quality and manufacturability up-front leads to a veritable cascade of benefits: higher production yields and rates, lower scrap rates and costs for scrap, reduced overhead from ongoing product issues, and cost savings due to reduced inspections. A patient-focused, proactive culture of quality engages staff to resolve issues faster, identifies new customer needs, optimizes operations, and reduces waste. Even the best programs cannot predict every possible product issue, address every way it could happen, and then prove it will not happen. However, a proactive quality focus can significantly increase awareness and responsiveness, as well as reduce the probability of having significant risks occur, minimizing the impact on patients and the business. Major quality issues can easily put small- and medium-sized companies out of business. Considering quality up-front, as well as demonstrating increased quality and preparedness for quality issues, reassures both for first-time and repeat investors, and increases their willingness to invest. With value-based purchasing systems, hospitals are no longer paid solely based on the quantity of service provided. As hospital systems and providers are increasingly held accountable for value and quality, they will seek to move from transactional relationships with manufacturers to those built on transparency. Manufacturers that demonstrate a commitment to quality and a solid risk-mitigation strategy may become more attractive to hospital systems. A survey conducted by FasterCures revealed that, although patients trust their providers and hospitals to use their health data to make decisions that will benefit their lives, they do not trust medical device manufacturers to do the same. One challenge to trust is transparency, especially when many patients only hear about medical devices when a recall is covered in the media. Consistently demonstrating quality — potentially through independent assessment via CDRH’s pilot program and through education about how device data are tracked, shared, and used — may be one way that manufacturers can proactively build a positive reputation among patients. Shifting mindset and action toward higher quality is not an overnight process. Within their organizations, champions of quality must first create awareness that the value of quality, including the cost of poor quality, is real, measurable, and actionable. They must also communicate that insight about building a better product is not gained through compliance audits, but rather through an investment in quality. What are the essential components of the design or process? What are the probable ways the design or process could fail, including worst ­case scenarios? What are the risks if the design or process fails in one of those ways? What mitigating actions will be taken to minimize the severity or probability of the failure occurring? How well and how quickly does the organization identify and resolve quality issues? How does the organization communicate and incorporate learning across organizational units and functions? If we consider our common goal of making safe, effective, and life-enhancing products for patients, it’s clear that investing in quality will pay off. This article was originally published on Med Device Online and is being republished here with permission. Stephanie Christopher, MA, has a background in health communication, public health project management and communication education and training. Stephanie joined MDIC in 2013 and manages MDIC’s patient centered benefit-risk assessment, patient engagement and quality initiatives. Prior to joining MDIC, Stephanie worked with an academic public health team working on interventions to improve the quality of communication between physicians and parents of newborns with abnormal newborn screening results. In 2012-13, Stephanie went on leave from her academic position to do a special assignment for the Food and Drug Administration Center for Devices and Radiological Health (CDRH), updating and training staff on a new risk communication process. Stephanie has also served as an adjunct instructor at Marquette University, teaching introductory communication courses.